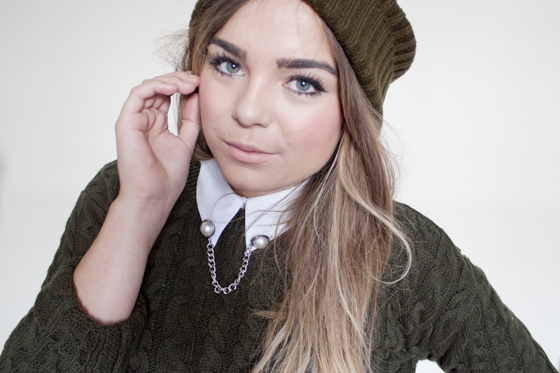 Lily Melrose - UK Style and Fashion Blog: why do you wear makeup? I saw this tag go around on Youtube a bit after Sammi & Louise did a video on it. So I thought I'd post my thoughts on basic jist tag and then I sort of went off on a tangent! It's basically about your makeup history and how you feel about it! I started wearing makeup when I was around 14, not religiously but on the odd occasion. I remember buying a few bits and pieces from Boots whenever I had a few pennies but nothing much. I used to wear quite heavy thick black eye makeup when I was around 15, but not really much on the skin as I was lucky and had good skin when I was a teenager. Although used to religiously use Maybelline Dream Matte Mousse if I did! The though of using that now makes me cringe! I started caring a little more about brands and cosmetics as I went into college as I had a job and a more money to spend on cosmetics. Then joining the community obviously played a bit part in becoming a huge consumer of cosmetics and beauty. I think when your around people who look amazing you naturally want to know what products they use to try and capture some of their looks. In my experience most things don't work for me, we are all different therefore I do really take everything I read online about beauty with a pinch of salt, but that doesn't stop me spending hundreds if not thousands on beauty each year. In the last 3 or so months I've cut the makeup I wear in half. Despite this I've found people seem to comment more on the fact I wear too much makeup despite wearing a hell of a lot less than I used to. Although this is mainly on the internet, as if they'd say it in real life though and I'm gonna be honest here... I don't really look the same without makeup. I look like me, but just not the long lashed, winged liner, heavy brow person I normally am! I genuinely don't feel I look like myself without my signature "look". I wear makeup pretty much everyday and I hate that I have to apologise for doing that. I don't ostracise people who choose not to wear makeup by saying they should wear more. Mainly because thats just really unnesscery and the bottom line its offensive. So I find it incredibly strange when people are put down for wearing makeup. I wear a make most days, I blog almost everyday so it's just a case of having to put it on. Although I don't wear makeup at home all the time and I'm not so obsessed with it to the point that I won't leave the house without it. But I just prefer spending that 10 or so minutes making myself look and feel better. I don't use it as a "mask", but it's hard to explain how I feel about it without sounding like I'm unhappy with the way I look without it because I'm not at all. I just think what I look like with makeup is what I "look like" not the fresh faced person I wake up as. The bottom line is I wear makeup because I love it. I find it interesting and engaging and that never ending search for the Holy Grail items excites me. The thing about the beauty industry is that it's infinite, it's constantly changing and adapting and this is what draws me in so much. I love trying new products and testing things out. I might end up with 20 odd foundations and I know I'll want to move onto another one in a few months time but this really makes me excited!